THE RACE – THE FAIR! Around 20 exhibitors were looking forward to a veritable rush of participants and their families and fans in 2018. In 2019, the trade fair will once again provide a lot of variety in the stand concept in the context of the 32nd Austria Triathlon in Podersdorf from 30th August to 1st September! So it will also give 2019 the opportunity to set up their own tent or a pagoda tent (5x5x2,5m with ground and electricity) to use. The fair will be back directly after the finish and thus be easily accessible for the athletes and the spectators. The triathlon specialists Expo 2019 in Podersdorf (30th August to 1st September): BE THERE! We always make sure to attract a good mix of exhibitors and at the same time limit the seats to promote YOUR sales success through a clear number of exhibitors! For this reason, we cordially invite you to contact us in good time and become part of our successful specialist trade fair! The AUSTRIA TRIATHLON in Podersdorf is the third largest triathlon competition in Austria. The catchment area of ​​eastern Austria is well covered. Since we also have the sprint and Olympic distance in our program in addition to the half and long distance, an extremely wide audience can be addressed at our fair. In total, around 2,500 interested triathletes will start in Podersdorf, waiting for new products and exciting offers. 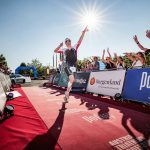 The AUSTRIA TRIATHLON in Podersdorf is a real family event. Many participants bring families and friends – and therefore more customers – with them. The fair takes place directly at the finish area, so that all participants pass the fair several times (automatically). In addition, the relative end of the triathlon season offers great opportunities: sales, presentation of next year’s products, customer retention 2019, top-of-mind awareness among the top target group in the East. And last but not least, you benefit from our top-class support provided by our experienced trade fair team.